The primary role of parents is to turn youngsters into confident, independent individuals – not to babysit forever. Making the transition from young to middle adulthood is undeniably overwhelming, considering the increasing responsibilities in almost all aspects of life. I know how comfy it is to hide under the shadows and success of your parents, but what about establishing something you can call your own? The age bracket of 20-30 years is a huge window to emerge as the butterfly from your old man’s cocoon. The best time is now. Being independent doesn’t equate to leaving your parent’s house, or not asking any money. It’s about taking the lead and control in your life now. Being less dependent means you’re not staking your being on chances, but on personal choices. Having that adult mindset implies many things. It could be making small investments, occasionally answering for your family’s expenses, or simply managing your personal space at home. These small milestones eventually amass and sculpt the adult you ought to be. Accounting abides by the business entity concept which separates business from personal transactions. The same principle can be applied in life. I’m not saying your parents thought of you as an investment; it’s just that you have to have utmost autonomy at some point in your life. Your needs, choices, life decisions are all within your control. If you’re a young adult who purposely depends on your mom for your breakfast cereal or who consults her about the slightest of problems, you’re further digging yourself into a deeper hole. Growing up means being in control of your life. It’s not like in the good old days where your parents will fetch you whenever you get lost in the Manhattan Mall. It’s a vicious world out there that would demand every dose of talent and motivation you have. Ever tried going out for 10 days all by yourself or with other people? There are tons of other opportunities out there waiting to be seized. Your parents will surely be proud upon seeing you expanding your horizons. Majority of us wouldn’t want our victories discounted or undermined because it was spoon-fed to us. Do you think heirs of multi-million dollar companies are completely satisfied when they’re alone in their high-end chairs? Meanwhile, not asking for money or living separately from your parents boosts self-confidence. It shows that you trust yourself and the abilities you’ve acquired through the years to take you into greater heights. Being independent means not running to anyone to resolve petty matters. Your friends and colleagues will also applaud that you’re trying. It gives them an insight of what you can really bring in to the table as a distinct individual. Plus, you get stronger and more resilient as you reduce your dependence to your parents. As a responsible offspring, you need to make sure that your parents get the fitting retirement they deserve. 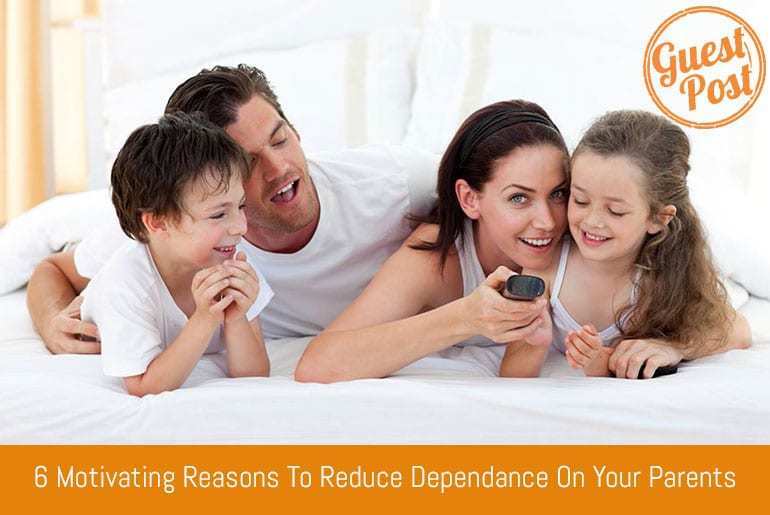 Reducing dependence on your parents enables them to better enjoy the good things in life. These things could be: a second honeymoon without chaperon, travelling with less guilt, and saving more. When you become less dependent of them, it gives them pride and a sense of fulfilment. I feel sorry for teenagers who were coerced by their parents to take a particular college program because it’s a family tradition or deemed to be a very lucrative job. They can love it after some time, but the ‘what ifs’ and ‘could’ve beens’ will always be their worst nightmares. As early as now, stand up for your own. At the end of the day, who’ll be directly impacted by the decisions you made or were forced to make? You. You don’t need to always think of how would your parents react or consider your decision. Doing otherwise instills fear on your mind, restricting you from taking the big shots in life. Your parents want nothing less than the best version you can be. However, they have lives of their own too. Eventually, you need to live a separate life outside their borders. I have nothing against folks who opt to stay in their parent’s house to caress them every day. But wouldn’t it be nice to visit them during the weekends to tell their grandsons or granddaughters how strong-willed you’ve become. That, of course, happens before you guys open and savour that Budweiser beer case. Independence and happiness – that’s the Holy Grail of life. You may not be able to achieve all of it right now, but you can choose to start with baby steps.